can be seen in every town"
After coming here and seeing the Lake Garda art and craft shops, it is difficult not to take back home a favourite memory or scene. 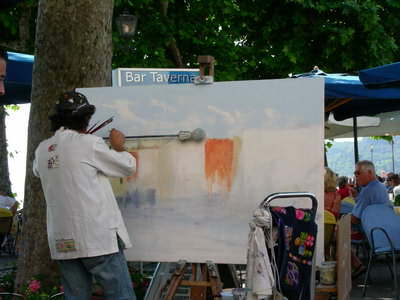 Local artists can be seen working all around the Lake and their work reflects the beauty and vibrancy you will find here. If you are an artist yourself, then I am sure Lake Garda will inspire you to get back to the canvas and produce your own Lake Garda masterpiece. The paintings here are very colourful and capture the vivid colours of the flowers and plants you find all around Lake Garda. 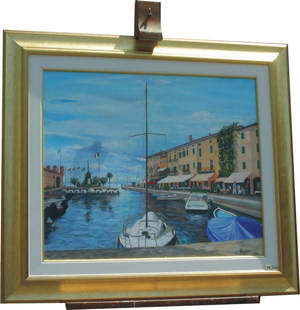 Oil paintings are great for this and you will find a lot here in the shops. Water colours are also used quite a bit and we were pleasantly surprised at the prices of most of the paintings. We discovered some truely wonderful back street artists in the towns. I'll be going back sometime with a large vehicle and will buy a whole load of them to take home! Local crafts are still very much found in this part of Italy. People with craft shops here often make their own products in the back of their shop and the items are usually very unique and individual. 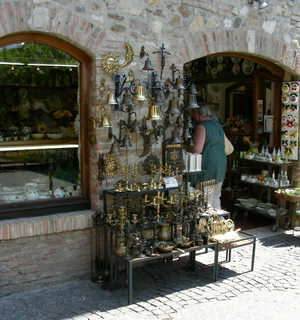 Brass and copper items are very popular at Lake Garda and you will find little back street shops full up with unusual things which can make great gifts! The local pottery is very nice and these are often painted to make them look even nicer. Wood crafts are found here too and I once bought a great model ship (which is a good size) for only 18 Euros. Again, the prices for all these types of goods are very reasonable.